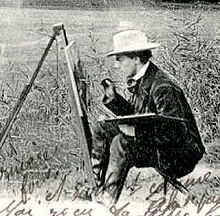 Born on 21 January 1848 in Paris, Henri Biva came from a family of painters, and like his kinsmen, Paul and Lucien Biva, he learned the technique of genre painting early in life. The artistic environment of Biva’s early years was dominated by the rise of the Realists and the belated public recognition of the Barbizon painters in the official halls of the Salon. Biva himself arrived at the Ecole des Beaux-Arts in 1873, at age 25, somewhat later than was typical. Given his modest family background, it is entirely possible that his delayed art education was the result of having performed his military service during his early 20s—and more significantly, during the difficult years of the Franco-Prussian War of 1870-71. At the Ecole des Beaux-Arts, Biva’s studies were directed by Léon Tanzi, a respected genre painter, as well as by the landscape artist, Alexandre Nozal. The influence of both instructors is visible in Biva’s work, but it is clearly Nozal who ultimately steered the young artist into a career as a painter of the natural world. Beginning in the late 1870s, Biva exhibited oil paintings of water features and flower arrangements at the Salon, enjoying sufficient commercial success to make his living. Images such as The Waterfall illustrate why his work was popular; it is a carefully detailed and richly textured painting of a small cascade tumbling into a forest stream. Like the naturalist painters such as Jules Bastien-Lepage or Rosa Bonheur, there is a strong tactile quality to Biva’s work, focused on the shapes, colors and forms of the small plants beside the stream or the smooth grey surface of the tree trunks. Equally important in the nineteenth-century marketplace, this type of landscape painting offered an intimate glimpse of a specific locale, a reminder of days spent in the French countryside, or perhaps at the immense forest preserves surrounding Paris. Unlike contemporaries such as Pissarro or Monet, Biva’s landscapes suggest a time before industrialization when no railroad or factory disrupted rural vistas. Rather, these images show no evidence of human activity at all except for the occasional fisherman drowsing by the riverside. In 1886 Biva also exhibited three works at the newly organized Exposition Internationale de Blanc et Noir, an exhibition that reflected the growing enthusiasm for graphic works of art in many media. As art historian Alison McQueen notes, “In a sequence of four displays in 1886, 1888, 1890 and 1892, these exhibitions grew from installations in the Salle des Etats at the Louvre to more ambitious expositions in one of the Palais on the Champs-Elysées.” [i] Biva’s contribution to the 1886 display included Street in Ville d'Avray, Night, Roses in Nice, and Gillyflowers. Although the medium for these works remains unknown, it is likely that they were either watercolors or pastels, formats that Biva used throughout his career. The expanding interest in graphic formats related directly to the increase in the number of middle-class collectors who sought to display sophisticated artwork in their homes, but who could not afford the more expensive paintings available at commercial galleries. For an artist just beginning to establish a reputation, such as Biva, the Exposition Internationale de Blanc et Noir was an ideal venue to nurture potential clients and develop a public presence. Although Biva’s career seems to have flourished during the 1880s, he received particular acclaim in the 1890s beginning with his first honorable mention at the Salon des Artistes Français in 1892 when his work as a painter of landscapes and flowers was especially noted. Three years later, in 1895, he received a third class medal, and in 1896, a second class medal. With this third award in place, he was no longer obligated to submit his work to the annual jury for acceptance, but instead was guaranteed an automatic position at the Salon. The turn of the century brought Biva continued success and public renown. His landscapes and flower paintings, still widely sought after by art collectors, gradually evolved into more meditative images. At first glance, a painting like By the River appears to be a serene landscape featuring a calm stream edged by sunlit grasses. Closer inspection, however, reveals that Biva has framed the composition with dark green overhanging trees that direct the viewer’s attention to the bright splotch of water in the distance, skipping over the small figure of the fisherman seated on the river’s bank. Combined with the uncanny stillness of the image, Biva suggests a Symbolist tone here, eliciting a mood of somber reverie within a sunny, but slightly claustrophobic, glade. Similarly, his twentieth century flower paintings are also Symbolist images. Like his kinsman Paul’s still-lifes, Biva’s work from this time period seems almost disembodied. For example, baskets of glowing roses emerge from undefined backgrounds, lit from within, but without any indication of the setting. Surely, the floating flower forms of an artist like Odilon Redon must have offered inspiration for this type of image in Biva’s work. In 1900 Biva received a bronze medal at the annual Salon, and was also elected a Chevalier of the Legion of Honor. This crowning achievement seems to have stimulated still more commercial success in the years preceding World War I. Following the war years, Biva’s sales rebounded and, in fact, he was still exhibiting paintings at the 1928 Salon, the year of his death. [i] Alison McQueen, The Rise of the Cult of Rembrandt, Reinventing an Old Master in 19th-century France (Amsterdam: Amsterdam University Press, 2003), 279.